Purple smoothies are the NEW green smoothies. Because, antioxidants. Don’t worry, you can still have your kale, in case you were wondering. 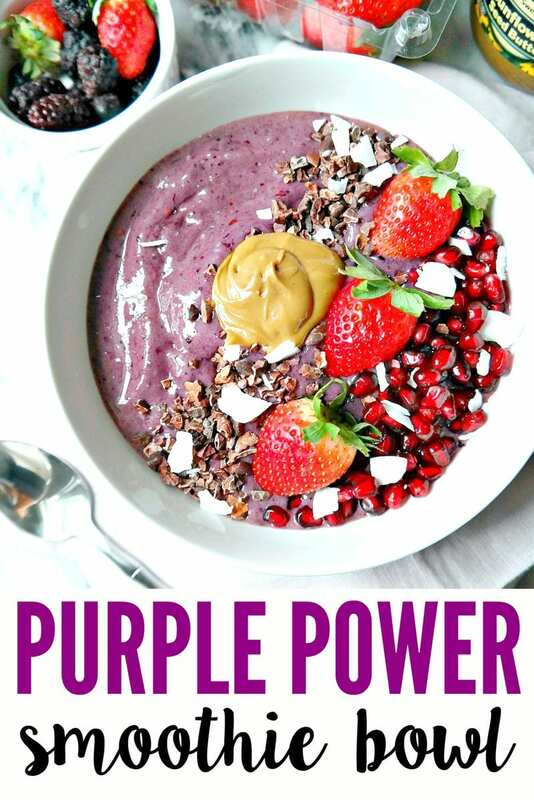 So it’s basically a green smoothie, but in purple power form. 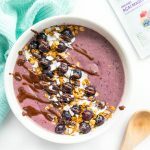 If you loved my Energizing Green Smoothie Bowl then you will love this Purple Power Smoothie Bowl. Creamy, dreamy, nutritious and delicious. With a couple superfoods, of course! You know I like to sneak superfoods in everything. 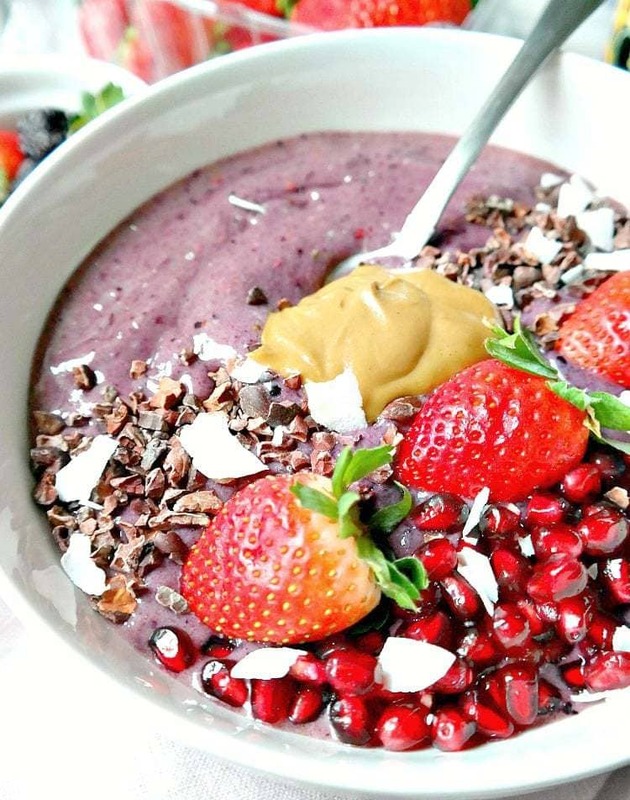 Specifically, maca powder and hemp seeds for this power bowl. 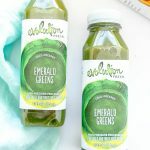 Green smoothies and green juices kickstarted my health journey and lead me to the plant based lifestyle so they will always be at the top of my smoothie list, but they’re missing the goodness that is antioxidants and extra fiber from mixed berries. 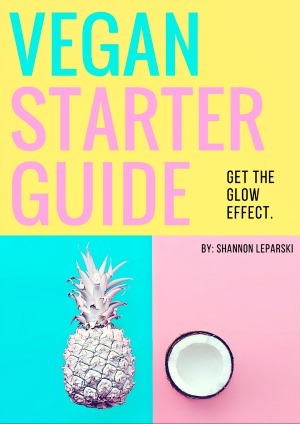 So now I consider green smoothies to be more on the tropical side and choose fruits like banana, mango and pineapple if I want to keep the vibrant green color. 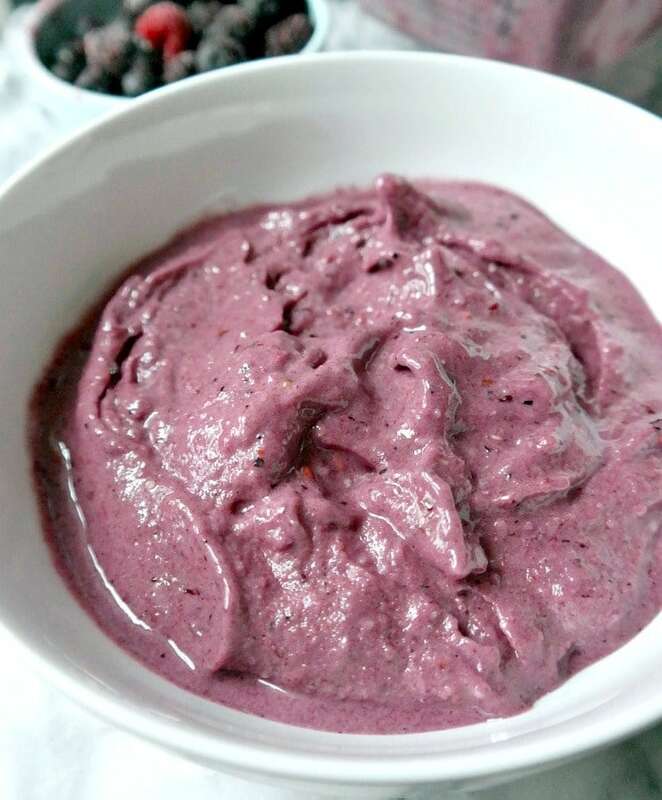 If I want to have the best of both worlds with greens AND berries, the smoothie will be a purplish color, depending on the type of green and amount of berries. Usually I’ll add at least 3-4 cups of kale or spinach (or both) into my morning smoothie which turns a weird purplish gray color because blending purple and green obviously produce a weird pigment. 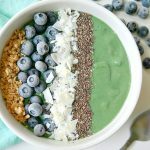 So for pictures sake, I used a small amount of spinach in this Purple Power Smoothie Bowl but I encourage you to add lots of greens – especially if you don’t care about the color. 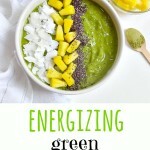 If you do care about the color, then 1 cup of greens shouldn’t change the color too much. 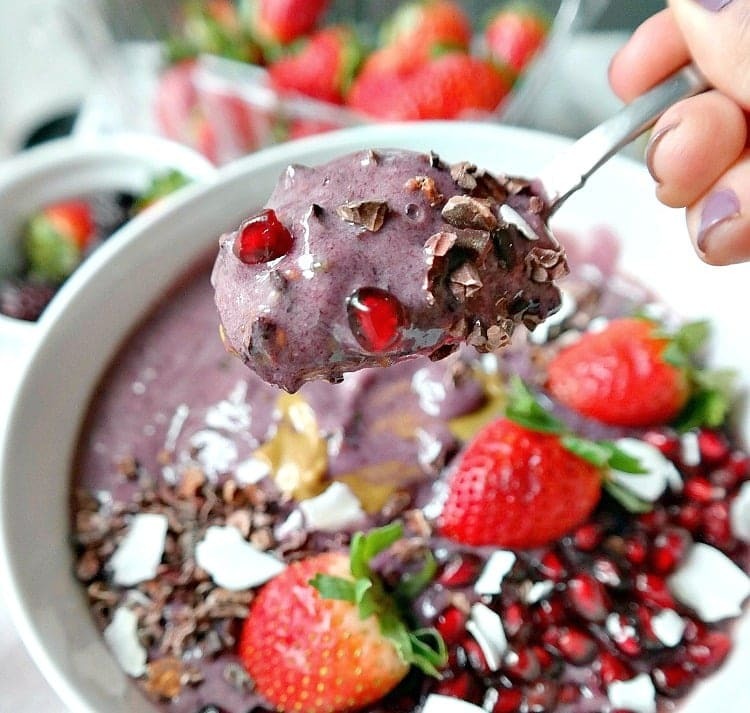 The key to a perfect smoothie bowl would be frozen bananas and frozen berries which give you that thick, scoop-able consistency, making it feel more like a real meal than a morning drink. A splash of almond milk or water with patient blending – and you’re good to go! (Learn how I freeze my bananas for perfect smoothies bowls here). I chose maca powder and hemp hearts because I always add those two superfood ingredients into my morning smoothie – no matter what. Maca Powder: is an energizing adaptogen that not only regulates hormones but increases fertility/libido and strength. Consider it a stress-relieving powerhouse powder with 31 minerals (!) which will you a boost of natural energy and tons of phytonutrients (my favorite brand here ). 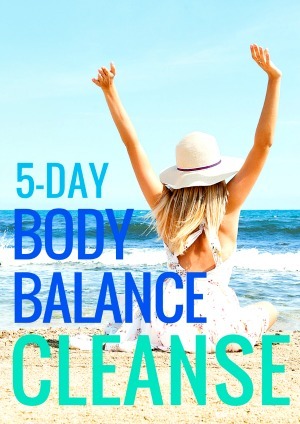 Balancing, energizing and mood-stabilizing. Hemp Hearts: a powerful source of vegan protein containing the perfect balance of omega 3 + 6 essential fatty acids and ALL of the amino acids as well. 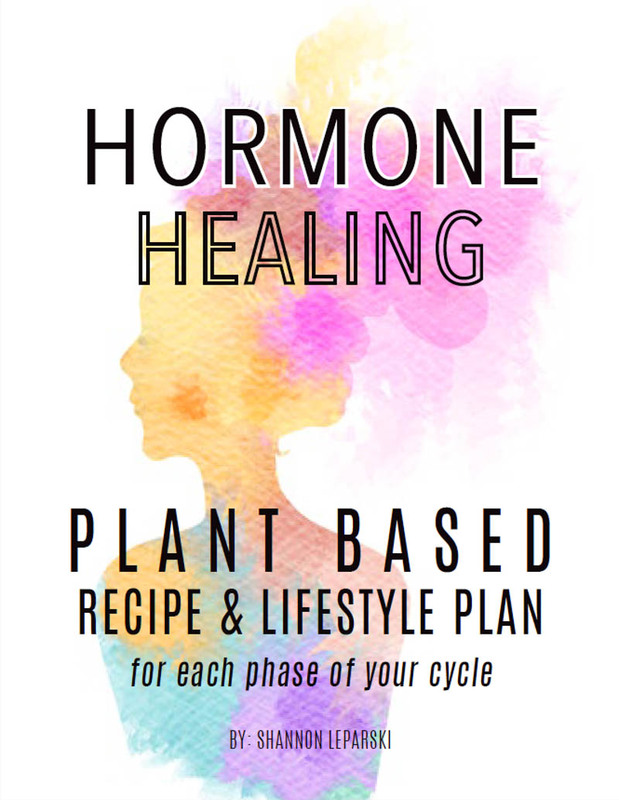 Easy to digest and a great source of magnesium, iron, calcium, manganese, zinc, phosphorus, and copper. I add them to everything!! (my favorite brand here ). 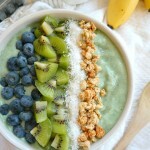 Overall, this is a breakfast bowl that will keep your body fueled, your cells nourished and your mind energized. 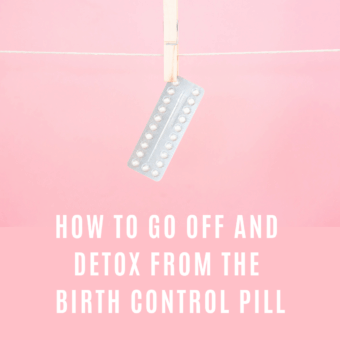 It’s totally balancing, easy to make and beautiful. Let the frozen bananas defrost for about 10 minutes for easier blending. 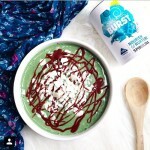 Add all ingredients to a high speed blender (or food processor) and pulse/blend until smooth and creamy, scraping down the sides every so often. Try not to add more liquid as the consistency will become too thin – the goal is a thick texture. Transfer to a bowl. Add your favorite toppings! 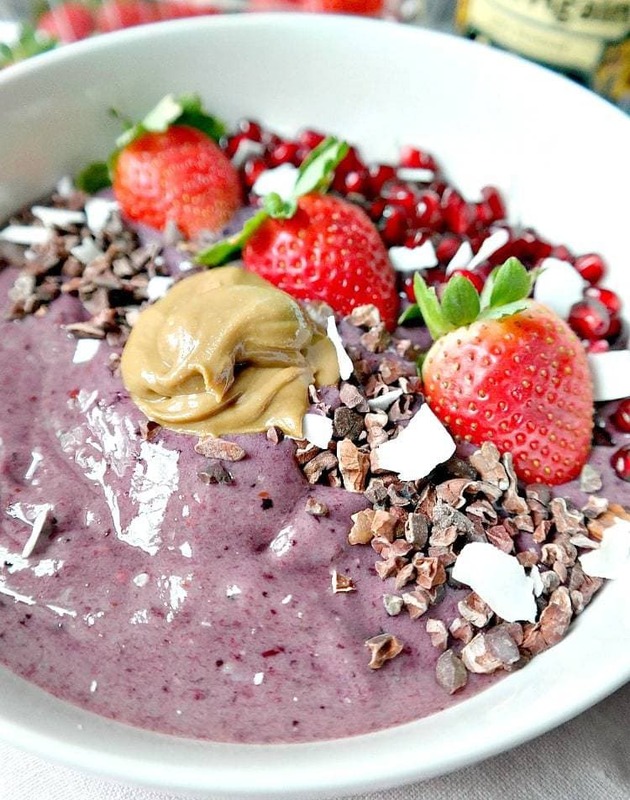 I used pomegranate seeds, strawberries, cacao nibs, coconut flakes and a spoonful or sunflower seed butter. Use anything you like! Would you mind sharing what type of blender you use? Mine is dying out and my smoothie game desperately needs an upgrade!